The Advertising Standards Authority has rapped the Inverness City Advertiser (ICA) for implying illegal drug use in an email mailer for its website Whatsonhighlands.com. 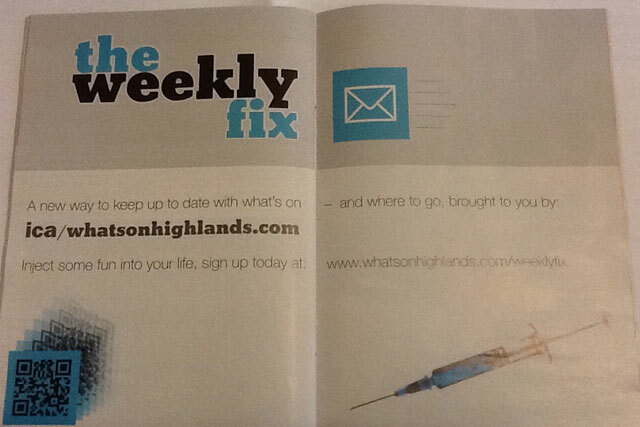 A postal mailing for a weekly email, called "the weekly fix", from Whatsonhighlands.com said, "inject some fun into your life, sign up today", alongside a picture of a hypodermic syringe and needle. The ASA received five complaints that the ad, which was created in-house, was irresponsible and likely to cause serious or widespread offence. ICA said it had already decided not to publish the mailing, not because it thought it was irresponsible, but because it did not want to cause offence. The publisher claimed it had used a blue colour in the syringe to convey the "injection of information" and claimed the positive uses of hypodermic needles far outweighed the negative aspects and that syringes were not synonymous with hard drugs or heroin. The ASA found that although in isolation "the weekly fix" and "inject some fun" might be understood as saying the emails were essential reading, alongside the needle and syringe and in the context of a lifestyle mailing, it was likely to be understood to imply recreational and illegal drug use. The ad must not appear again in its current form and the ASA warned ICA not to use text and imagery that implied illegal drug use in future.